Tips – Airport to hotel usually requires tips to the taxi or bus driver, the hotel porter and the person who escorts you to your room, usually in the currency of the country visited. At the dock, you tip the baggage attendant. Aboard ship, usually at the end of a voyage, gratuities are expected for the cabin steward, table waiter and wine steward; they average $10 to $15 per day per passenger. Additionally, the large glass jars found at every bar, coffee stand and piano, lure appreciative customers. On many ships, crewmembers are paid very low wages; they count on gratuities for their subsistence. Meals – All cruise lines provide breakfast, lunch and dinner. Many, additionally, feature alternative specialty restaurants providing a variety of ethnic, vegetarian, or grander style foods with menus listing meal costs and, sometimes, cover charges. However, if you are off the ship touring a village or city or taking a bus trip to a not distant but difficult-to-get-to destination, meals are on your own. Count on it! Beverages - Once upon a recent time, there was BYOB. 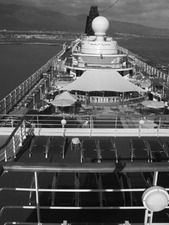 Social life aboard a luxury liner was more exuberant, with balcony parties, and group socials. Now, it’s illegal on most carriers to bring your own bottle. You have to pay for miniature ones from the cabin refrigerators or order an expensive bottle from room service. In lounges and the main dining room, drinks cost from $8 to $12 each; thus a glass of beer with lunch, a before-dinner-drink at dusk and wine during dinner can average up to $35 per day. On some ships, wine only comes in bottles, so jack up that price. Soft drinks are less costly but still an added expense. If you bring liquor onto the ship, your purchase will be stored on your behalf and returned when you disembark from the vessel. If you’re allowed to bring wine on board, expect a corkage fee. Computers – Technology has been transported to transient super vessels. Every ship has an Internet Center. You can pay a package price user fee for time packages, such as $70 for one and one half hours or $480 for 20 hours, or pay $.75 to $2 by the minute. You can use your own wireless computer and hook it up to the ship’s server; however, you pay the same prices. Both incoming and outgoing emails are $2 each. I learned of one frantic college president spending $500 in one morning sending and answering emails. Computer classes are also offered. Tuition is from $10 to $60 depending on the number of sessions. Telephones – Luxury liners have a telephone in every cabin. Using them on the ship is fine, but it can cost from $8 to $25 a minute to call the U.S. Your cell phone is useless, unless it has international access capabilities. Calling from foreign ports can also be expensive. Personal Services – Laundry and pressing services (very necessary for formal dress dinners when ketchup lands on your white shirt), massages, beauty salons and spas are additional charges. Babysitting – Costs are from $10 to $15 per hour or more. Fortunately, most of the daily activities for children are free. Money Exchanging – For most sea tours, currency is that of the country visited. For many others, you may dock in a different country every morning. Usually, money-exchanging fees are charged by banks and money exchange centers. Visitors are often unsure of the amount of funds needed for their respective site meals, gift buying, city tours, museum and gallery excursions and land transportation. Often, one has money in a particular currency left over and must exchange it for American dollars or the currency of the next country visited. American Express notes, traveler’s checks, cashing personal checks and ATMs all have costs. Docking Charges – Whether your liner arrives at a pier or tenders transport you, you can walk or ride to your local destination. Sometimes, the ship’s representatives arrange the bus or van. Other times, you pay for a roundtrip taxi or shuttle. Shore Excursions – These are the major reasons you took a cruise. Touring the historical, mythical, and architectural wonders of the world are the baits for the beholder. The customs, culture, cuisine and characteristics of a country can best be understood by being there, by personal experience. Every cruise line features organized tour programs with guides, occasionally with meals, through cities, to exotic locations, to view rare animals and their habitats. Macchu Picchu in Peru, the tango show in Buenos Aires, the Opera House in Sydney, the Louvre, the Blarney Stone and Alaskan glaciers are all favorite examples. Cruise line excursion prices range from $40 to $200 per day. They can be one-hour city tours or seven-hour bus rides to see penguins. These tours can be booked prior to departure (strongly advised), or you can sign up once you’re onboard. Additional Expenses – Many shipboard purchases are more costly than their land-based equivalents, Bring film, batteries, notions, medical services, bottled water and pharmaceuticals. A lost book from the ship’s library can cost $50. Ship photographers pop up everywhere, later to peddle their photos and videos. Casinos, shipboard shops and art galleries vie for your money. Historians and naturalists sell books. Costs for medical services on a ship run the gamut but are much higher than land based equivalents. If you’re hesitant about committing your vacation time in case of an emergency or due to a health problem, there’s trip insurance to buy. Often, air travel and hotel arrangements made by a cruise line carry a commission. Tips – Check before departure. Know what to expect. Tip on your own. A few cruise lines include gratuities in the ticket price; otherwise, tipping is your choice. If you feel the service of your steward, waiter, or other attendant was exceptional, reward the individual. If not, forget it. Meals – Eat all your meals in the main dining room. Menu items are included in your fare. Return early from shore visits. There are usually free food offerings such as salads, hot dogs and hamburgers available in various ship locations throughout the day. Beverages - Modify your drinking habits. Conserve your alcohol consumption. Use your imagination. Water has a great resemblance to both gin and vodka, and Coke looks just like whiskey. Have a beer or cocktail before returning to the ship in the late afternoon. Computers – Save your email checking and sending for the mainland. These days, every foreign port has ample Internet cafes and centers. Don’t use the ones closest to the dock. Go into the center of town. Prices range from less than a dollar to three for up to three hours on a computer. If there’s a public library, usually there’s free computer usage. Telephones – Cell phones can be used in Alaska, Hawaii or the U.S. Virgin Islands. For the ship and other foreign ports, a Global System for Mobile Communications (GMC) capable phone is necessary. They range from $100 on up. With them, you have international roaming charges from 50 cents to $3 per minute, and long distance charges from 25 cents to $1.50 per minute. Check with your cellular provider for pricing on international calls. Another method is to purchase a prepaid international phone card online before departure. This way you have low long distance rates wherever you are and no matter what type of phone you are using. How about a penny a minute? Personal Services - Use the self-service laundry and ironing rooms. Take a hairdryer if the cabin you’re booked in doesn’t have one. Use onshore services. Every port has laundromats and cleaning establishments. Salons and barbershops usually cost less ashore than aboard a ship. Babysitting – Children’s play centers are supervised by play directors and counselors. Lots of parents trade off for meals and going-to-bed rituals. Having found new friends, many parents barter schedules with one another for childcare. Money Exchanging – Ships usually deal in American currency, so using your credit card to obtain cash before docking can save you a great deal. In many international or large cities, American dollars are welcome as tips and payments. Inquire before you use services. Depending on the length of your stay, it is often financially beneficial to obtain foreign funds from your U.S. bank or American Express prior to your departure. Monies can be kept in your cabin safe or with the purser. Airport exchange windows are expensive. Docking Charges – Prior to departure, check what transportation is provided by the cruise line upon arrival to your destinations and what is not. Shore Excursions - Because they can become so costly, wise tourists assume that in each city there are touring services, guides, bus companies and visitor’s centers existing to accommodate both cruise line tourists and those who venture to their cities on their own, by plane, train, or car. Read travel books; explore the websites of places you plan to visit. Before you leave, research tours and excursions available in the cities you will tour. Make your own reservations by phone or email. While on tour, share rides with newfound friends. Additional Expenses – Pack batteries, film, skin lotion, pills, and anything else you expect to use in your luggage. Use small containers in plastic bags. Check with your doctor and dentist to get a clean bill of health before departure. Take your own digital pictures on your trip for sharing later. Arranging your own flight plans and hotel stays prior to embarking and upon final destination arrival may be less costly than relying on the cruise company. The Bottom Line – Plan, plan, plan ahead. Do your homework before you chose a cruise line to the destination of your choice. Many do include tips, beverages, alternative menus and other services, avoiding “hidden charges.” Talk to people who’ve previously voyaged to your chosen destinations. Numerous travel books and websites are devoted to economical travel. Fodor’s, Frommer’s, and Let’s Go Travel Guides are among them. Helpful websites are VacationsToGo.com, CruiseCheap.com, SmartCruises.com, CruisesOnly.com, Cruise.com, and metafares.com.